Last summer, I read Edward Ball’s The Inventor and the Tycoon(2013). The nonfiction account chronicled the unlikely relationship between railroad entrepreneur Leland Stanford, Muybridge, and Thomas Edison who refused to collaborate with Muybridge who suggested they combine Edison’s phonograph with Muybridge’s invention of the projector. Muybridge was the first man to use celluloid in motion pictures. His invention of the zoopraxicscope, a prototype projector was revolutionary. Edison will steal Eadweard’s process, update his projector, and show it at the 1893 World’s Fair competing with Muybridge’s outdated zoopraxicscope. It will make Edison more famous and secure the patent while Eadweard Muybridge will become forgotten. 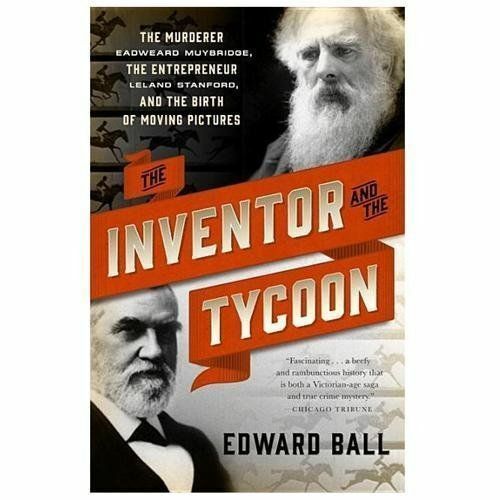 Check out The New York Times article from January 2013 by Candice Millard for an interesting full review of The Inventor and the Tycoon. An excellent way to learn about Eadweard Muybridge and his weird world is by watching the BBC hour-long documentary. Eadweard Muybridge was foremost a photographer and considered by most as the “forefather of the cinema”. How freeze-frame photography and how motion pictures began is as interesting to me as the version we know today. Have you read the book, seen the film, or watched the documentary? I recommend all three. Thank you, Alex. I hope you get a chance to catch the film. It’s very good. That was an interesting bit of history I was not familiar with. Thanks for sharing. My pleasure. I bet you would enjoy the book. It sounds an interesting film, and I am familiar with the freeze frame photographs, although I did not know the photographer’s name or story. I’ll keep my eyes open for the film. Knowing your interest in the time period, I bet you would appreciate the book. So, too, the documentary. Excellent post, bio and critique of one of the early “Masters of Motion” and discovering what our eyes miss in the simplest or most complex actions! The clip looks intriguing. With a distinct “Prim and Proper”, David Cronenberg “A Dangerous Method” look vibe, morals and feel about it. Hi Kevin! Thanks for your input, as always. I hope you get a chance to see the film –if you like nonfiction, the book is interesting. I was reallt taken by the shot of the man sitting on the edge of a chasm. Wonderful post! Thanks very much. He’s fascinating. I like the roots of inventions. ive seen the documentary. thank you for writing about the feature film. I hadnt heard of it, and am now looking forward to finding it. Hi Bill, and I can’t believe I beat you to a movie ;). I am very curious about your thoughts on editing. There’s a lot of cuts and the effect seems to be like a freeze frame–if that’s what they were trying to do, mirror the man, then it’s clever. Maybe it’s just sloppy editing. I need your expertise to tell me. Obviously an important pioneer in Film. Question: has digital now completely replaced film? Or will it? Very cool! Eadweard Muybridge … what a great name too. Thank you for this insightful post, Cindy! Can’t wait to see this new film and will watch the BBC doc when I get a chance. Thanks! Thanks Rick! I’m glad you stopped by to comment. Edison was a bit of a creep. He didn’t treat Tesla very well either. Isn’t he, though? Rather ruthless. I have watched the bbc documentary about Muybridge. Fascinating. I sure will. History of photography is one of my favorite things to learn. I did see the documentary, and will look forward to what looks to be a fascinating film. Thanks, Cindy! Hi Pete, Oh, good. Yes, I was quite impressed with Eklund’s performance. He nailed his eccentricities. Brilliant sounding film, Cindy. I watched the trailer and can’t wait for this to become available. What a captivating man and artist. And Eklund seems a perfect fit to play him. And thanks for the link on the BBC documentary. It’s now on the list to watch as well. I know him well but have not seen either film or read the book. We studied a little about him at university and watched the horse images. I’m going to have to do a little digging and find these. Nice post, as always. Thanks for flagging this film, looking forward to watching it. There was an excellent Muybridge exhibition on at the Tate a few years ago (http://www.tate.org.uk/whats-on/tate-britain/exhibition/eadweard-muybridge) and that really got me interested in him, especially his perseverance and dedication to his images and the lengths of experimentation he went to. Look forward to watching the documentary this week! Wonderful! I will check out the Tate link this morning. The BBC documentary was fascinating. I’m so glad you came around; I need a feminist perspective in the future for the Lucky 13 Club. You are so talented and would be a fantastic guest speaker. Maybe in 2016 you would agree to writing a brief blurb about a film? I’d love to be involved, I think it’s a great way to bring bloggers and film lovers together. Will keep an eye out for future instalments and volunteer when the time is right! PS – how are we talking (writing?) about 2016 already! No kidding! I can’t believe Sept. is half way over. I like movies about artists. I loved “Frida” which goes to show you a woman doesn’t have to live in the shadow of a man, as artists. I liked Ed Burns as “Pollack” while Marcia Gay Harden played his wife. I would probably be intrigued by this fascinating and bizarre filmographer. I have just picked up to watch tomorrow, “Mr. Turner” with Stephen Spall as the British 1800’s artist of landscapes. ( I was on a 60 people long wait list at the library. It had Academy Award nominations in 2014). Thanks for also sharing book and 2nd movie about Muybridge. Great post with a lot of info, Cindy! Hi Robin! I love Frida and Pollack was pretty good. I watched Mr. Turner a month ago and the cinematography was outstanding and the performances. It sounds like a very interesting movie and he sounds like a very interesting person. I thought I’d never heard about Eadweard Muybridge until I got to that picture of horses on the Youtube clip. I was dimly aware of an argument in the 19th century as to whether or not horses always had a foot on the ground. I checked with Wikipedia and sure enough, it was the same guy. I’ll be even more interested to watch the story now. 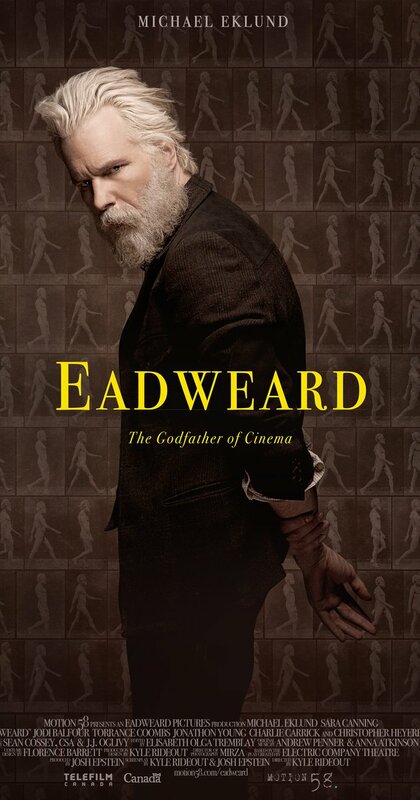 Perhaps it’ll explain why he spelled his name Eadweard. Interesting. I wonder if his parents named his brother Aelfraed or something. LOL. Wigmund. Ecgberht. Any name from Beowulf would be cool. Wow! Is Ecgberht a name? I’m not sure I’d want to be saddled with something that looks so completely like a typing error. I wonder a) how it was pronounced? and b) how anybody could distinguish the pronunciation from a coughing fit? Interesting, underneath that spelling was lurking the name Egbert. I was genuinely interested to find out about his siblings, but rather disappointingly they were apparently called George and Thomas. He really pulled out all the stops when it came to naming his son, though. The NNDB site says he was called Floredo Helios Muybridge.